XML Plans Saga –Twilight – A gist of what graphical execution plans look like. In this blog post (Breaking Dawn Part 2), I shall talk about the latest release in the SQL family… SQL Server 2012. With the new avatar of the Management Studio, you now have an Extended Event (XEvents) configuration wizard. Even though Extended Events have been around since SQL Server 2008, there wasn’t a wizard available for the configuration of the same. 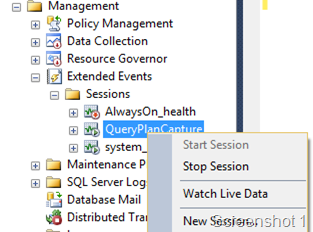 I am going to explain how XEvents can be used to capture execution plans and the existing XEvent Viewer in SQL Server 2012 Management Studio (SSMS) gives you a nice view. 1. I first used the Choose Columns option to pick the columns that I wanted to be available in the events pane. 2. Then I picked the Grouping option to group on the object_name column value. You can only group on events which are visible in the events pane. 3. Then I picked the Aggregation option to provide me with a SUM of duration and cpu_time values for each of the event occurrences. You can see the final output in Screenshot 2 below. You can now see that I have all the execution plans for the execution of the stored procedure sp_helpdb. The Details pane actually gives you the option to view the graphical query plan. Another tip is that if you double-click on any of the events in the details pane, then either open up in a new pop-up window or a new query window depending on the field (eg. showplan_xml). 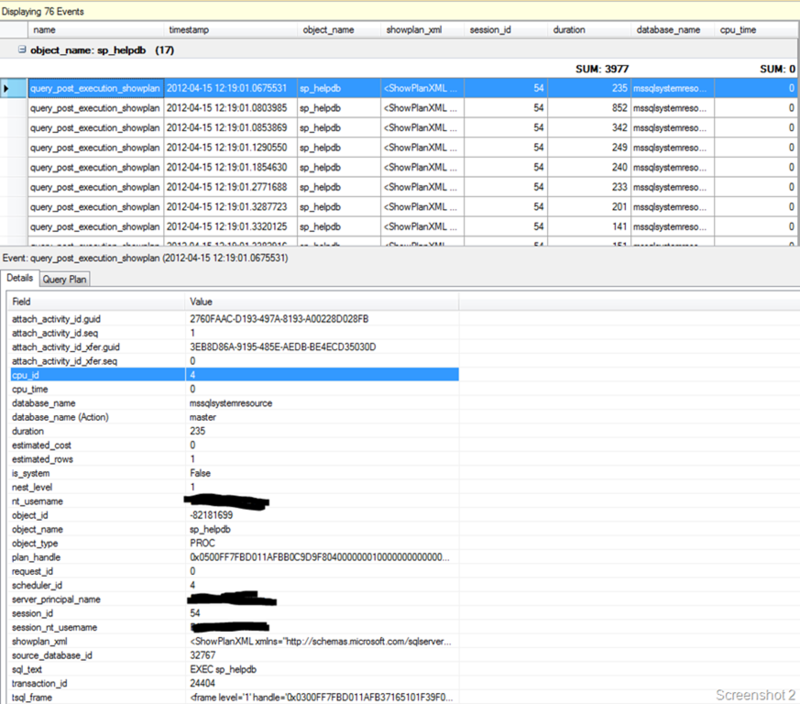 As you see from the Screenshot below, there is hordes of information I can pickup from the output without having to start a profiler trace. Since you get the plan_handle and the actual query plan, you can use the queries from the previous posts in the series to get the set options, missing indexes, compilation and execution statistics for the query as well. However, the aggregation option in the XEvent Viewer gives you a head start on a lot of this activity already. Hope all of you have some fun reading these posts on XML plans and put all this info to good use in your SQL environments! Till next time Ciao and happy query plan spotting! !